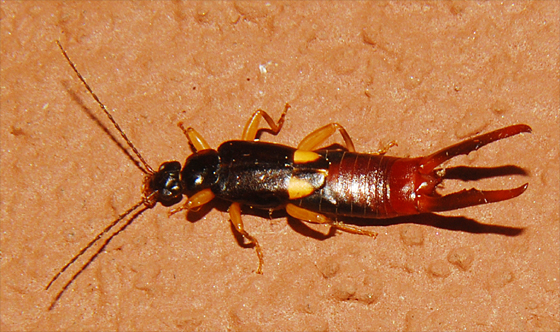 This earwig was running across the outside wall below a light. He had his rear-end pincers held in an upward posture (defense???). Any help with ID would be appreciated. Thank you very much for the compliment. Now how do we get it in Guide? I'm new at this. With a quality photo like this, if you simply leave your post here, some editor will eventually put it in its place. Better yet, save the editor some work and move the image yourself. Were this my post, I'd leave it here a couple days, then move it. To make the move, click on tag. (Actually, tag all since you have multiple images.) Now go to where the post belongs - I'll provide a link below - and click on move tagged images. That's all. More helpful stuff like this is found at the, uh, Help tab. It's sort of a mini manual for the site. Here's your link; note that it takes you into the Image section of the relevant insect pages. Note: I found the section by searching Earwig. If you get a solid, better ID, you should put your critter there after a similar search. If - hopefully - this is a new species for Bug Guide, a new page will be created. You can request that page in a forum. Thanks Ron, I appreciate the help. I'll take your advice and leave it here for a few days.